You know your commute to work like the back of your hand. You have the drive etched out in your brain including contingency plans for every possible train, bridge, boat, slow poke and the ever present road construction. You know which spots are no-go zones when you are running late (which NEVER happens to me-cough, choke). You’ve got the whole commute down to an art form-like knowing at which point you need to be in the right or left lane and which spot you can’t have any vehicle in front of you as you approach your right turn just in case the light turns red and you are stuck for 2-3 minutes while your co-workers are stealing your favourite parking spot. Just me? Am I the only neurotic one? Is this behaviour exclusively for those of the unorganized persuasion? Just because we plan on things going one way, that doesn’t mean they will. You can map out your route, your construction project or your life, but we all know things can go wrong. Contingency plans, back-up plans or Plan B-no matter what you call it-don’t always work but they certainly help. Building or renovating a house can be a frustrating experience if not planned out well but as our buddy Murphy and his inevitable list of laws warn us, things don’t always go according to plan. I built a house years ago, or rather I chose a subdivision and a blueprint from the builder’s selection and then miraculously 3 months later, I moved into my brand spanking new home. I am not usually a terribly organized person (and this is where my friends and family that I force to read my blog gasp in mock shock, or perhaps do an eye roll and throw in a derogatory comment or two) but I can be the Queen of all organizers (complete with colour co-ordinated cape) when I actually try. When I built my house, I wore that Organizing Queen cape proudly. At the time, I was moving from one town and (it’s important to mention here), school district to another town and school district, working two part time jobs and babysitting a few neighbourhood children all while raising two daughters with a shift worker husband. I had a binder in which I kept every imaginable detail regarding the construction of my new house, the sale of my old house and since the construction was slated to be completed ten days prior to Christmas (yes-crazy, I know) I also included my Christmas lists. I was uber organized but let me tell you-if I lost that binder, I would have had the mother of all melt downs. With my detailed lists of paint colours, flooring choices and brick selection etc plus the various Christmas gifts that were purchased, wrapped and where they were hidden plus which job I was working at and whose child I was babysitting-everything should go smoothly, right? Stop laughing people-we all know that that couldn’t possibly happen, especially when I was juggling that many balls at the same time. One of those balls was bound to drop and bounce down the stairs only to roll under the furnace. Aside from having to pick a new building lot a week before construction was supposed to begin because the house was too wide for the lot, the coveted island I always dreamed of having was not going to fit in the dream kitchen (until I drew a sketch, road map and diorama), the framer neglected to include head room going down the stairs because the blueprints told them not to and (here’s my favourite part) the house was delayed two weeks-meaning we’d be moving in after Christmas instead of before-the entire process wasn’t too painful. There were so many things that could have gone wrong but we had a good builder, a temporary roof over our heads and of course, my binder and cape. If you are planning on building or renovating, bring your lists in to Ferrell Builders’ Supply and we’ll help you with your material selection as well as help you choose a contractor. These contractors and builders are our customers which means we sell them building materials and talk to them all the time. Several of us have hired them ourselves. Once you’ve got your contractor picked, listen to them, go over your details together and understand no matter how well you prepare yourself, sometimes things don’t always go according to plan. In the end I had a beautiful home that I loved and a builder that I valued. I learned a lot during the building of my home. I was grateful that I, for once in my life was organized because if I wasn’t, the problems and stress I could have encountered could have rendered me catatonic. I like to think that because of my obsessive planning, Murphy didn’t do too much damage. As I get older, I have become better at organizing my life. I write/type lists (and lists and lists), don’t sweat the small stuff and have traded my binder in for a cell phone and laptop, but I absolutely refuse to give up my cape! Since the Christmas season is upon us, I thought I would do my own version of the classic Twelve Days of Christmas. Humour me and read all the way to the end. Enjoy-and don’t forget to sing all the ways through! On the first day of Christmas my true love gave to me a messy and mucky yard. and a messy and mucky yard. On behalf of everyone at Ferrell Builders’Supply, I would like to extend our wishes for a very Merry Christmas and may 2014 bring yougreat happiness, superb health and wonderful prosperity. I don’t know about you, but I just love autumn-the colourful leaves, the crispness in the air, sitting outside around the fire pit roasting marshmallows….yum! 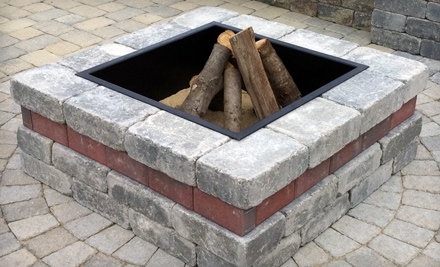 Speaking of fire pits…..come in to one of our stores in Hamilton, London, Waterloo or Fonthill and talk to our knowledgeable staff about building your own fire pit (check your local by-laws first). Can’t you just taste those smores now! The design choices of 2013 will be shaped by uncertainty over how long current home owners will stay and what future buyers tastes may be. So, home owners needs and style preferences are more influential in today’s designs than what buyers want. 1. Smarter, Less Costly Automated Controls: With lives continuing to be busy and automation costs coming down, it’s become more affordable to control a home’s systems temperature, security, electronics, lighting, and more through a single device, even from an iPhone, iPad, or iPod. Doing so can eliminate multiple controls and make it easy for home owners to manage things around their home, even when they aren’t there, says Jim Carroll, a founder of Savant Systems in Cape Cod, Mass., which designs and develops integrated automation solutions. The average family has more than 80 different devices that can be controlled with one system, he says. Anna Lowder and husband Harvi Sahota are incorporating more of these systems in homes they build for their Mercer Home residential building company in Montgomery, Ala. One example is the Nest Intelligent Thermostat, which can be controlled remotely, react intuitively to home owners habits, and adjust to conserve energy costs. 2. Outdoor Living Rooms and Screened Porches: A trend that began a few years ago continues to inspire home owners to think beyond terraces and decks. These spaces have more of the feeling and function of an indoor room better furnishings, fire pits, curtains, and even televisions and audio systems. Some spaces are designed as courtyards for greater privacy, yet with high-efficiency glass windows and doors to make them energy-smart and seamless with indoor rooms, says Lowder of Mercer Home. Further helping to blur lines between outdoor and indoor spaces is the rise of screened porches, which have gained more indoor accoutrements such as fireplaces, making them livable nearly year-round. 3. Outdoor Kitchens, Vegetable Gardens, and More: Interest continues in outdoor food preparation of all kinds as simple as a grill and as elaborate as a built-in cook’s station with sink, storage, beer tap, pizza oven, refrigerator, and counter tops. Newer amenities include a hybrid grill that permits cooking with both gas and wood or charcoal and prefabricated kitchens that save funds, says landscape designer Michael Glassman in Sacramento, Calif. With a kitchen in place, many home owners move on to plant a vegetable garden, preferably including raised beds to avoid bending too much, Glassman says. He suggests starting with what home owners want to eat and cook tomatoes, peppers, garlic, and herbs for gazpacho or spaghetti sauce and learning through practice what thrives in an area’s soil and climate. Essentials are healthy soil, drainage, and readily available water. The next new food trend is a backyard pond with organically-raised fish that home owners can consume without trekking to a market, says Erik Coffin, CEO and owner of Gotham Capital Management in West Hollywood, Calif.
4. Themed Designs: After years of stark contemporary design, themed decorating is making a comeback, according to Montclair, N.J.-based designer Blanche Garcia. There are more home owners asking for a European flair, perhaps antique sconces and velvet pillows, she says. And partly due to excitement from the recent royal wedding, British-style motifs continue to proliferate, including Union Jack flags, red phone booths, and hounds tooth, floral, and crown patterns, says Paul Berberian, creative director of Brewster Home Fashions, a wallpaper company in Randolph, Mass. 5. Media Frenzy: With more families remaining home rather than traveling, rooms are being devoted to TV and other multimedia entertainment with comfortable seating, tables, and good lighting. They’re designed to have a more “home” feel than media rooms of the past, Garcia says. 6. New Neutrals and Color Pops: With the country still in the financial doldrums, neutrals remain more popular than vibrant hues, says Erika Woelfel, director of color marketing at Behr Paint in Santa Anna, Calif. Nevertheless, neutrals aren’t the same whites, creams, and beige’s, she says. A blue-gray that works well with the range of popular blues and the purples they’ve replaced are making inroads; they offer a fresh background, she says. In contrast, bright new accents such as such as raspberry-pink may attract greater attention than a straightforward red. There’s also a range of yellows, which complement blue-grays. And designer Ron Marvin of Ron Marvin Design in New York also sees a trend toward orange and purple accents. How long will these colors last? “Paint colors tend to move in cycles of five to 10 years and follow other home-decor categories, which in turn follow fashion” Woelfel says. 7. More Double-Duty Furnishings: With homes continuing to be scaled back and many baby boomers moving into condos, more furniture and furnishings need to do double duty in smaller spaces. Expect to see ottomans used for seating and storage, couches that convert to beds, and coffee tables that can rise for dining. This trend means that the one in a house that’s not shrinking is the garage, which is often still big enough for two cars and storage. 8. Lighter Looks: Smaller homes and spaces call for scaled-back pieces and better illumination that makes rooms look larger. “I don’t like overwhelming rooms” says Courtney Fohrman of Fohrman Interiors in Chicago. To achieve this, she suggests swapping out large bookshelves for wall-mounted shelves, opting for tailored furniture over clunky items, and welcoming natural light. 9. Green Merchandise: Interest in sustainable products and materials keeps attracting attention particularly when it comes to choosing paints, adhesives, counter tops, and flooring. “Most furniture companies and paint manufacturers have at least one item or line that fits the green movement” Garcia says. Large paint companies such as Benjamin Moore, Glidden, Kelly Moore, and Sherwin Williams offer zero-VOC or odor-free paints, according to Healthy Homes Plans, founded by Linda Mason Hunter, author of The Healthy Home: An Attic to Basement Guide to Toxin-Free Living. 10. Energy and Water Efficiency: Efforts to conserve energy and water throughout the home continue to be popular, including low-water toilets and sinks, better functioning furnaces, and improved insulation. Solar panels are more integrated into roofs so they’re less of an eyesore. Gray recycled water can be used in toilets and to water gardens, while more drought-tolerant plants and replacements for impermeable hard-scape allow greater water retention, Coffin says. 11. Panelized Homes: More factory-built homes help to cut building costs at the site by reducing the amount of labor time needed in the field. Besides cost savings, there’s the ability to improve quality control, says Eric VanDerHeyden, executive vice president of RSI Development in Newport, Calif., which uses a variety of plans ranging from 1,232 square feet to 2,500 square feet. “It can cut the cost in half and construction time from a year to eight weeks” he says. 12. Handcrafted Elements: Many home owners desire hand-crafted artisanal pieces for a greater personalized look. Some are made from reclaimed rustic wood, which adds a homey, inviting feeling, says Brad Ford of Brad Ford ID in New York. 13. Stylish Kitchens and Bathrooms: These remain at the top of many home owners wish lists, as they reflect the trend of remodeling rather than adding on, says Bill Millrolland, executive vice president of Case Design Remodeling in Bethesda, Md. The transitional look, a middle ground between traditional and contemporary has become more popular. This is evidenced by choices such as cove rather than crown molding, dark-stained or painted finishes rather than natural maple or cherry, and larger format tiles rather than smaller 12 by 12 and 6 by 6 ones, he says. Designer Wendy Johnson in Manchester Village, Vt., also sees continued interest in kitchens, particularly when they become even more open “live-in” spaces for cooking, eating, socializing, doing homework, or paying bills. Likewise, master suites serve multiple functions, including unwinding, sleeping, and bathing. Millrolland reports more requests for Universal Design features that permit home owners to age in place but don’t convey an institutional look: Grab bars masquerading as towel bars, kitchen counters of different heights for wheelchair access, and wider hallways and doors to permit walkers and wheelchairs through. No matter what the market’s doing though, the best advice you can give to home owners is to make design decisions based on their hearts and wallets rather than media predictions and hype.